Newly-elected DUCSU VP Nurul Haque Nur along with other representatives of the five panels who contested Monday's election gave on Wednesday the Dhaka University (DU) authorities three days to announce a fresh poll schedule. They gave the ultimatum in a memorandum submitted to DU Vice Chancellor (VC) Prof. Dr. Md. Akhteruzzaman. According to them, if a fresh DUCSU election is held, it must be held by March 31, 2019, as per an order issued earlier by the court. They also demanded resignation of all concerned involved in conducting the last March 11 DUCSU election. After handing over the memorandum, Liton Nandi, a left alliance panel's VP candidate in the DUCSU election to reporters, "The VC has rejected our demand and he has threatened to file a case citing anarchy and chaos on the campus." Nur said he would support all the demands of the students as an elected representative. He demanded re-voting in the DUCSU election and announcement of it within three days. VC Akhtaruzzaman said that there was no scope to question the election process. He told reporters in front of the DU administration building on the campus that the election could be held thanks to sincere efforts of both teachers and officials of the university. He also warned that any bid to create a chaos would not be tolerated. Even strict legal action would be taken to handle any such chaotic situation, he added. In another development more than three hundred students of Ruqayyah Hall started demonstrating together on Tuesday night demanding resignation of the hall's Provost Prof. Dr. Zeenat Huda. They also demanded re-election for the hall union amid allegations of widespread rigging and irregularities in the election. The students also demanded withdrawal of the case that was filed on Monday. The demonstration was going on until 6:00 am on Wednesday. Mousumi, a candidate contesting Ruqayyah Hall Union election, said that all the students except Bangladesh Chhatra League (BCL) panel were protesting throughout night but the provost didn't come. At a press conference at the DU Journalists' Association office, newly-elected representatives of Kabi Sufia Kamal Hall Union and Shamsunnahar Hall Union expressed their condemnation. They also expressed their solidarity with the Ruqayyah Hall students. 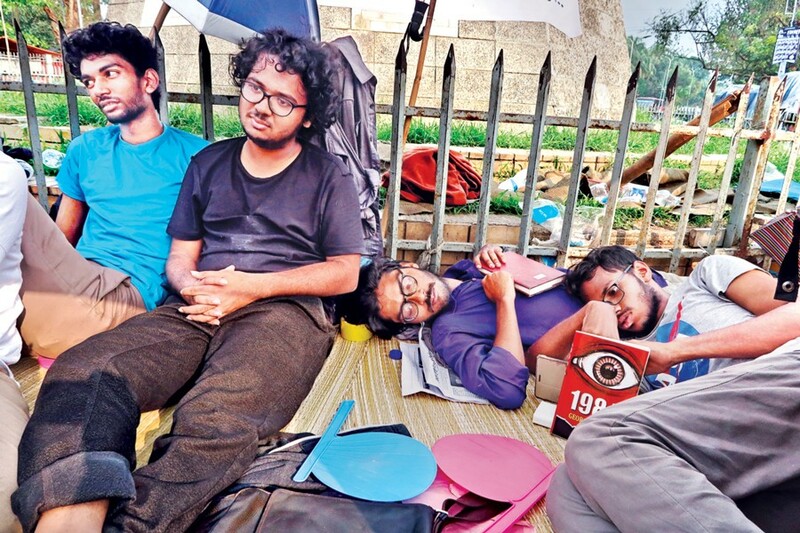 On the other hand, four students went on a hunger strike on Monday evening at the foot of the Raju Sculpture adjacent to the Teacher-Student Centre (TSC) demanding a fresh DUCSU election. The hunger strike continued until filing this report on Wednesday. The striking students are Tauhid Tanjim, Shoaib Mahmud, Aninda Mondal and Mainuddin. Tawheed Tanjim, a DU student of the CSE Department, first went on the hunger strike in protest against what he called massive irregularities and rigging in Monday's DUCSU election. Non-resident students could not cast their votes as they were intimidated by BCL activists. He added that they would continue the strike until announcement of a fresh schedule of DUCSU election.